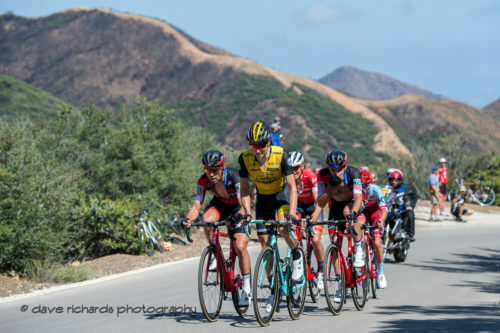 SANTA BARBARA, Calif. (May 14, 2018) – With just over 2k left to ride to the summit of Gibraltar Road, Team Sky’s 21-year-old Egan Bernal (COL) attacked and swiftly climbed away to a solo victory to close out Stage 2 of the 2018 Amgen Tour of California. Tao Geoghegan Hart and his Team Sky teammates set an unyielding pace all the way up the steep grade in support of lead rider Bernal to help launch him to his fourth victory of the 2018 season, shoring up the race lead as well as nearly all of the classification wins with today’s epic climb and overall performance. 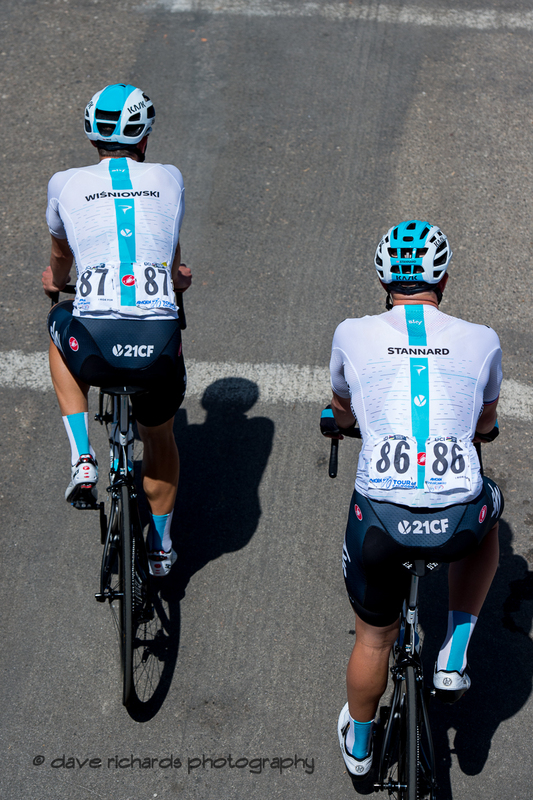 Team Sky’s tempo up the categorized climb caused several of the lead group filled with GC hopefuls to fall back. Those who remained when Bernal attacked included LottoNL-Jumbo’s Antwan Tolhoek (NED) and BMC Racing Team’s Tejay van Garderen (USA), who pursued aggressively, but were overtaken in the final kilometers. BORA-hansgrohe’s Rafal Majka (POL), who won last year’s mountainous Stage 2, claimed second place for the stage today with Mitchelton-SCOTT’s Adam Yates (GBR) in third. Bernal, also the reigning Columbian National Time Trial Champion, gained valuable seconds today over other time trail specialists who will be looking to make up time on that event Wednesday in San Jose / Morgan Hill. 21-year-old Bernal – who will wear the Amgen Race Leader Jersey tomorrow – also closed out the day with the TAG Heuer Best Young Rider Jersey, Lexus King of the Mountain Jersey and the Visit California Sprint Jersey. Holowesko|Citadel p/b Arapahoe Resources’ Ruben Companioni (CUB) earned the Breakaway from Cancer® Most Courageous Rider Jersey for his part in today’s breakaway that formed soon after the race left a beautiful oceanside start in Ventura and also contained Rally Cycling’s Adam De Vos (CAN) and UnitedHealthcare Pro Cycling’s Jonny Clarke (AUS). The trio was brought back by the peloton just before the start of the Gibraltar Road climb. Utah rider TJ Eisenhart finished in 23rd position. The Queen Stage came early this year with Stage 2 presented by Lexus leading cyclists 97.6 miles from first-time host Ventura to a fan-favorite finish atop Gibraltar Road in Santa Barbara County. The stage featured 7,700’ in elevation gain and a 3,100’ climb over the final eight miles. The race course showed some of the devastation – and the community’s road to recovery with thriving businesses that have reopened and were seen celebrating along the route – from fires and mudslides around the start of the year. Tomorrow attention turns to the race’s longest stage with a 122.4-mile stretch featuring six KOMs over and 8,300’ of elevation gain from King City to Laguna Seca Recreation Area, where the field will contest a fast, technical sprint finish. The Amgen Tour of California and the Amgen Tour of California Women's Race empowered with SRAM are Tour de France-style cycling road races created and presented by AEG. Running concurrently, the races challenges the world's top professional cycling teams to compete along demanding courses that traverse hundreds of miles of California's iconic highways, byways and coastlines each spring. The teams chosen to participate have included Olympic medalists, Tour de France contenders and World Champions, and award important, world-ranking points to the top finishers. More information is available atamgentourofcalifornia.com.